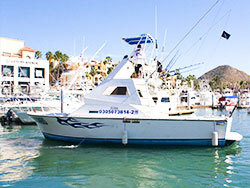 Cabo San Lucas is world-renown for its marlin-infested waters. People travel thousands of miles from countries all over the world just to get a taste of the deep sea fishing that Cabo can offer. Year-round fishing for marlin, combined with long seasons of such sport fish as mahi mahi, sailfish, roosterfish, wahoo and tuna is enough to make any fisherman salivate. Our 5 hour trips are popular with cruise passengers and families, and those who want to get a chance at "the big one" without breaking the bank. 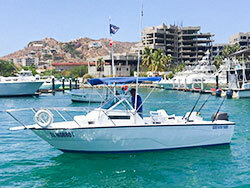 Our 8 hour sportfishing expeditions are the go-to for most serious fishermen staying in Cabo. While there is never a guarantee in fishing, it doesn't get any better than Cabo San Lucas, and we take you there. 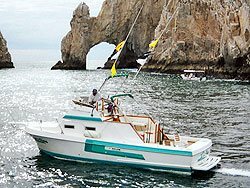 Our fishing trips head out past Land's End, so you can get great photos of the Arch and Lovers Beach on the way, as well as the Cabo San Lucas skyline. 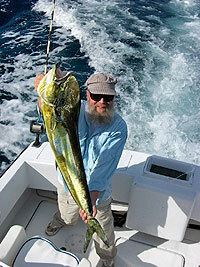 All our boats are in top-notch condition, and all bring home whoppers on a regular basis. Isn't it time you got yours? Join us for an exciting day of deep sea fishing! Cruise Passengers:	Yes! This exclusive charter is perfect for a cruise shore excursion! It is flexible to fit all cruise ship schedules. Schedule: Daily on your schedule. Departs: The marina in Cabo San Lucas. Exact meeting instructions will accompany your confirmation. Duration: 5 Hour and 8 Hour trips are available. If you are on a cruise ship, we can be flexible to fit your cruise schedule. You do not have to stay out the full allotted time if you have a tight schedule. *Cleaning and filleting are free on the boat but you will need to make sure it's done before you get back to the marina because the marina will charge a small fee for fish cleaned or filleted at the marina. Fishing License is 315 Pesos (Approx $20.00) per person. 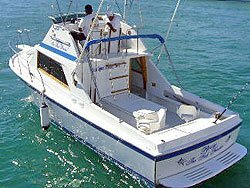 Logbook Tax ($15.00 USD) per boat, paid in cash. Note: Most sportfishing in Cabo is done with lures. Live bait is not required, but it is available for purchase if you favor it. Some fishermen prefer live bait for roosterfish, for example. All reservations require a 50% deposit to be placed by major credit card at the time of booking. The remaining balance will be shown on your confirmation and is due in cash at the marina. We cannot accept credit cards at the marina, only cash, but ATMs and banks are widely available in Cabo San Lucas and of course you can bring USD with you from your home country as well.